This week I was back to work finishing up two furniture pieces for a booth I have at my sons' school fair. 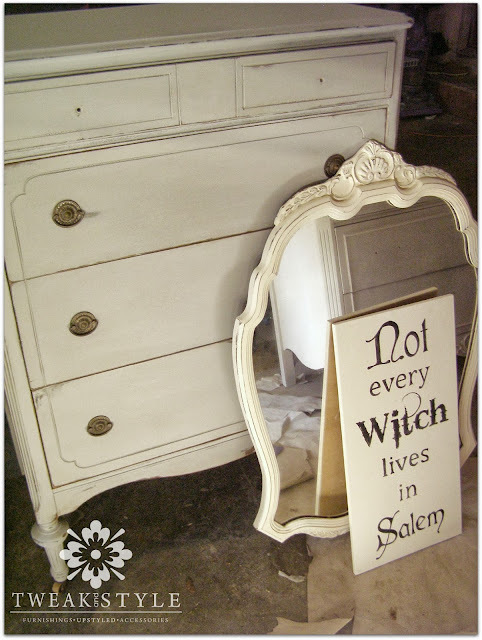 I am taking these pieces, as well as, an assortment of mirrors, signs and smaller items. I will let you know how this event goes. I have never had a booth at a fair before! Because this week and last week has been filled with prepping and painting furniture. the items everyone should have on hand to get old furniture ready for painting. 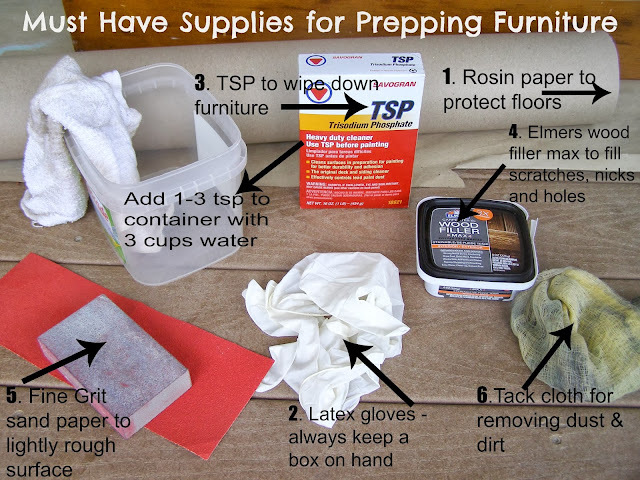 but if you prep your furniture correctly, things will be off to a good start. Lay down Rosin Paper - Now everyone needs to have a roll of this! It is available at all home improvement stores and painting stores. I cut a large piece to lay under the furniture I am working on. It lays flat and doesn't bunch like a drop cloth. When I am finished, usually the paper is not ruined with paint, so I just fold it, take it outside, shake any dust off and save it to reuse. It is easy to store unlike dirty and bulky drop cloths. I also use it to wrap signs I ship for my business and I use it to wrap gifts. Best bargain anywhere. Put on gloves - I always keep a box of latex or latex free gloves on hand to protect my hands from paint and chemicals. Lightly clean furniture up with TSP. Keep a box of this on hand too. It helps remove any residues on furniture so paint will better adhere. Now, fill any nicks, or knob holes if you are changing the knob placement, with wood filler. This Elmers product gives a strong repair. Once the wood fill is dry, sand it down, as well as, give the whole piece a light sanding, following the grain of the wood. This will give the piece a little extra tooth for the paint to grab. I also follow sanding with another wipe down with the TSP cleaner to remove sanding particles. When any wetness from the cleaner is dry, give your piece a final wipe down with a tack cloth to remove any small lint or dust remaining. Again, this stuff is the best, so always keep some on hand. I always use this product before top coating furniture with waxes or polyurethane too. Right now I am in the process of revamping two night stands and making them end tables. I will finally have end tables that match. I hope you follow me back so you can see the end result. Have a great day. Great tips! That dresser is so pretty. Have a great time at the fair. I am sure you will sell out!